Detecto’s ProMed® scales are the right choice for home, health, and clinical office weighing. The..
Detecto's ProMed 6127 medical scale is the right choice for home, health, and clinical office wei..
Detecto's model 439 features a height rod in inches and centimeters. The platform cover is easily..
Detecto's ProMed 6129 medical scale with height measurement rod is the right choice for home, hea..
Now, for the first time, you can combine the classic Detecto physician scale with the time-honore.. Accurate and reliable, Detecto's economical DR400C platform scale is lightweight and portable, ma.. These professional doctor scales are designed to meet the medical-grade accuracy you depend on. T..
Detecto's reliable DR400-750 digital physician scale is lightweight and portable, making it perfe.. Heavy-duty, yet lightweight, the 6857DHR bariatric scale's balanced design and integral wheels ma.. Heavy-duty, yet lightweight, the 6854DHR bariatric scale's balanced design and integral wheels ma.. 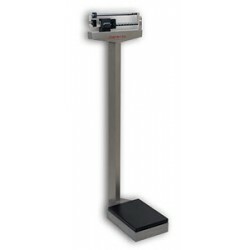 Engineered specifically for weighing obese and unsteady patients, Detecto's 6868 portable high-ca.. Heavy-duty, yet lightweight, the 6856 bariatric scale's balanced design makes it easy to move. Th.. Heavy-duty, yet lightweight, the 6855 bariatric scale's balanced design makes it easy to move. Th..